Last week, myself and Himself had our first proper holiday together. After four years, we decided it was time for a true test of our relationship. Time to see if a week together constantly would make us kill each other or not. Happily I can say both have survived, and despite both catching THE PLAGUE, we’re all good. We headed to the city of Seattle, Washington. It was my first time to the USA, and after that week I am hopeful it won’t be my last. However, I did notice quite a few elements of our trip which did make me question our budget for the trip. There were some things we did to ensure we got the best value for our dollar. 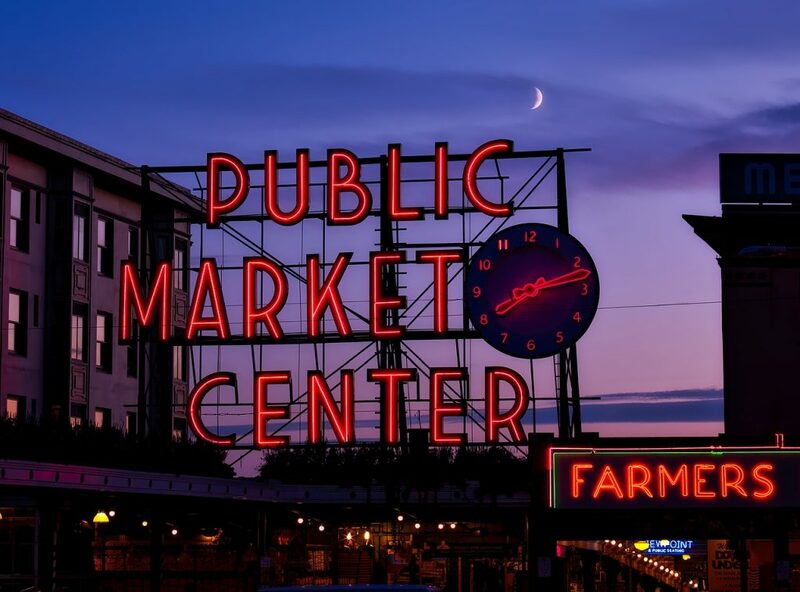 So, to pass on those tips, here’s my guide to visiting Seattle on a Budget – and it’s probably applicable for most cities in the US. Seattle is not the cheapest of places to stay. We put a lot of research into where we would be staying for the best value. Aghast at the number of zeros behind the figures for hotels, we took to Airbnb which while still being on the pricy side, definitely saved us a lot of money. We got a gorgeous little studio apartment up in Capitol Hill for about half the price we would have spent on a hotel. It also had the added freedom of it being “our own place” as such. Our host was lovely and accommodating, bed comfy and apartment perfectly clean and comfortable for two. The neighborhood we were in was really laid back but a five-minute walk from the busy bar district so perfect for all moods! If you want €35 in free travel credit on a new Airbnb account, follow this link – and enjoy your trip! I’m a user of Hailo here in Ireland more than I like to admit (blame Bus Eireann!). In Seattle, we wound up using a similar taxi hailing service, Uber, quite a bit. See, Seattle makes Cork look like flat land. Those hills, they kill your legs after a long day of touristing. We discovered a brilliant service within the app called “UberPool“, which allows you to opt for a carpool option. The driver will look for other passengers going your way and charge you a much-reduced fare, often half or less of the full fare. This is charged whether or not you have another passenger in the car. A lot of times, we wound up not sharing but still saving. Great idea if you’re travelling solo or as a couple/in a small group. If you’d like to get a free ride (up to $30), just follow this link from a new account and get your first trip free! If you’re travelling in a group, get everyone to set up an account and you can use the code each time 🙂 Yay for cheaper travel! Being in the city for just a week, we had a lot of tourist-ing to do and not much time to do it. Of course, we had certain landmarks, like the Space Needle, that we knew we wanted to see. We had a much larger list of maybes. Individually, these were going to be quite pricy. For example, the Space Needle for a two-entry (day and night) pass was set to be just over $34 per adult, with just one visit costing $22 per adult. We discovered the CityPASS option online and advertised at each attraction it worked for. We found that this saved us a lot of money and allowed us access to some fantastic places. 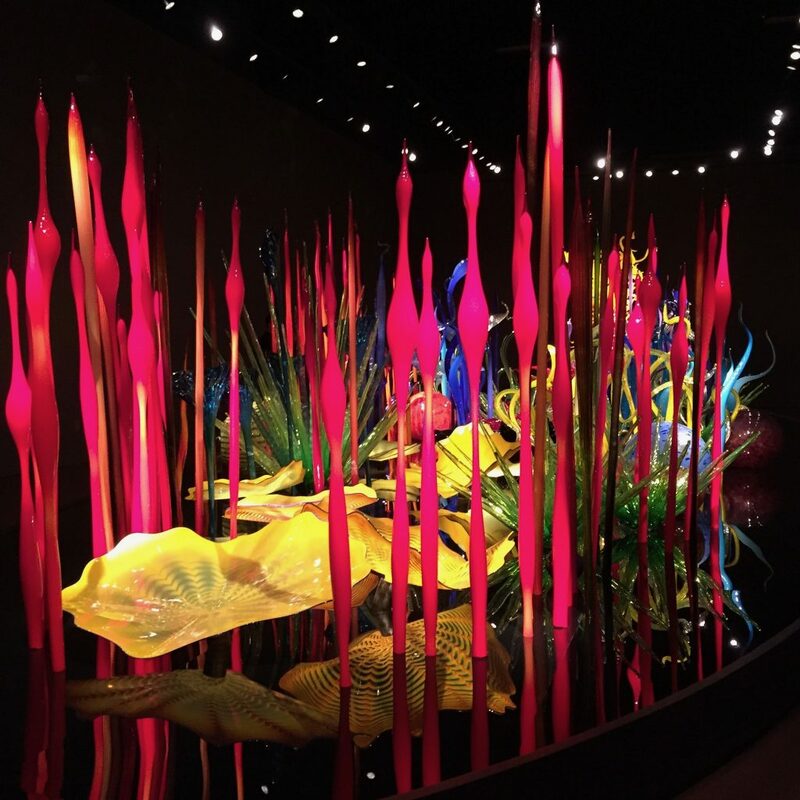 For $74, we had two-visit access to Space Needle, a visit to Chihuly Glass & Gardens, entrance to the Experience Music Project Museum, an hour long boat trip around the Elliot Bay area and Seattle Aquarium. Had we wanted to, we could have changed the pass for Chihuly Glass & Garden for the Pacific Science Centre, and the EMP museum for the Woodland Zoo. Overall, it saved us about sixty dollars. It gave us the chance to see some absolutely great attractions with little fuss. They also have passes for other cities in the US as well. If you’re going touristing I’d recommend taking a look to see what is covered wherever you’re headed. The Space Needle is wonderful, no doubt about it, but it’s by far not the only incredible view of beautiful Seattle. To get those all important pictures and views in, while still seeing Seattle on a budget, skip it and try Smith Tower or Columbia Centre. Smith Tower is a gorgeous building in the Pioneer Square neighbourhood. It’s complete with elevators that have operators and have been there since 1914. Make sure to grab a craft cocktail in the Temperance Bar up in the Observatory while you enjoy the view. Tickets for the Observatory cost $12. If you want to go even higher, the Columbia Centre is for you. Just be mindful that your ears might pop! At 902 feet (275 metres!) high, the 76-storey building is topped by the Sky View Observatory. It allows the highest view of this incredible city – even Smith Tower looks tiny from up above. Tickets for Adults cost $14.75 and you can spend as long as you like up there. There aren’t any alcoholic drinks served, but it is a gorgeous view and there is a cafe open from 11-7 on weekdays, 12-7 on weekends. Seattle is a gorgeous city full of sights and sounds. I spent most of the trip looking up in awe at the beautiful architecture. Simply wandering around the city can be a really enriching process. Grab a coffee from any of the tiny coffee shops (or the 136 Starbucks in the 2.5 mile radius of the city) and take it all in. Pike Place Market is an endless source of interest. It’s got changing stalls, an active fish market, and beautiful things which may inspire your spending. The Queen Anne area has beautiful views, with the post-card perfect Kerry Park overlooking the city. The Central Library is definitely a work of art in itself. It’s a rather strange mishmash of designs which is well worth a look. The library itself is shaped like a stack of books. Speaking of beautiful libraries, if you take a trip up to the University District, the University of Washington is home to the Suzzallo library. It bears some likenesses to that of Hogwarts fame! As a big fan of old stone buildings, I really enjoyed soaking up the atmosphere! If you’re a Starbucks fan, you can visit the Roastery and try out different coffee blends. Or while checking out Pike Place Market, Â visit the first store of the chain. 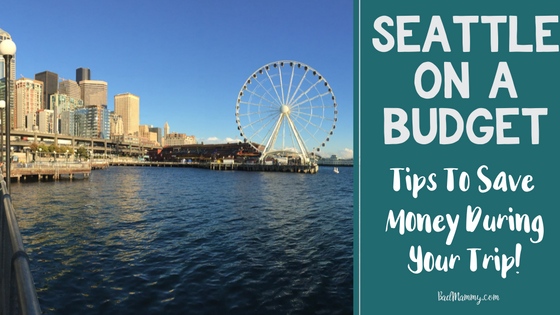 So, those are my top five tips for seeing the sights of Seattle while saving money. Have you got anything to add? I’d love to hear other suggestions for future travel, as it’s a place I can’t wait to return to! This post contains affiliate links. All are things I used and found useful on my visit to Seattle. The use of these codes to give you free credit will also allow me to earn commissions to fund further travel. However, I was not paid for these tips and these recommendations are all my own based on my experiences from my recent trip. I would love to go to Seattle. I’m a proper tourist and like to see as much as we can. We did something similar in New York, choosing the tickets that allowed to go to several things for a reduced cost, it all adds up! Great tips that can be used in many different cities. I would love to visit Seattle.